We went to Good Shepherd for Palm Sunday mass at 5 o'clock. The deacons handed out palms before mass and Father Jess blessed them at the beginning. That way I didn't have to hand them out after. We went to Guerrero's for dinner. We saw the goats up on the hillside. When we came out, it was raining again. I took the photo on 27-January-2012. 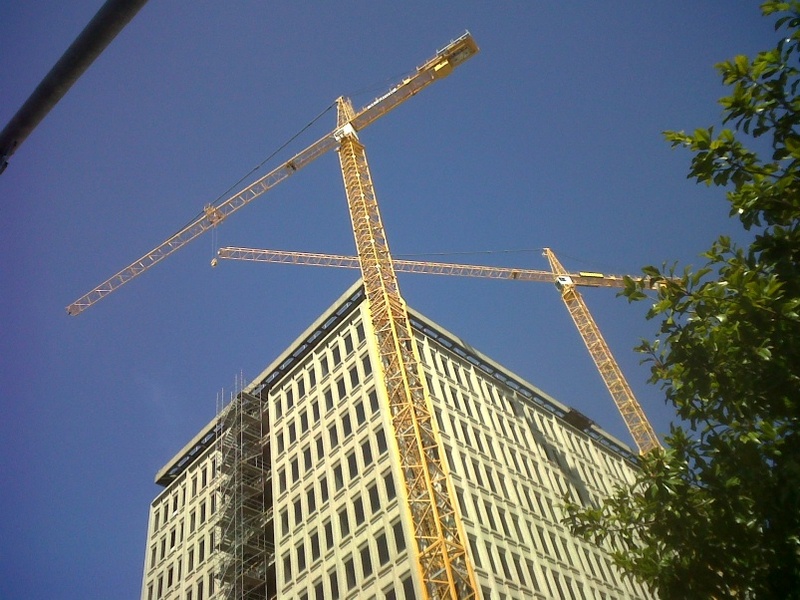 For the last month or so, we have been watching these cranes pick pieces off of a building on Folsom Street. Lately the workers have been dismantling a structure on the roof. Every day there are loud booms and crashes that shake our building. I think the workers enjoy it when they set off car alarms. Yesterday I got to work and found fencing stacked up on Third Street. There were ladders and rolling platforms in the lobby, with a bunch of workers. One got into the elevator with us. I asked what was going on. He said they were going to tear out the lobby and the plaza and open it all up. When I got to my desk, I found an email about it. 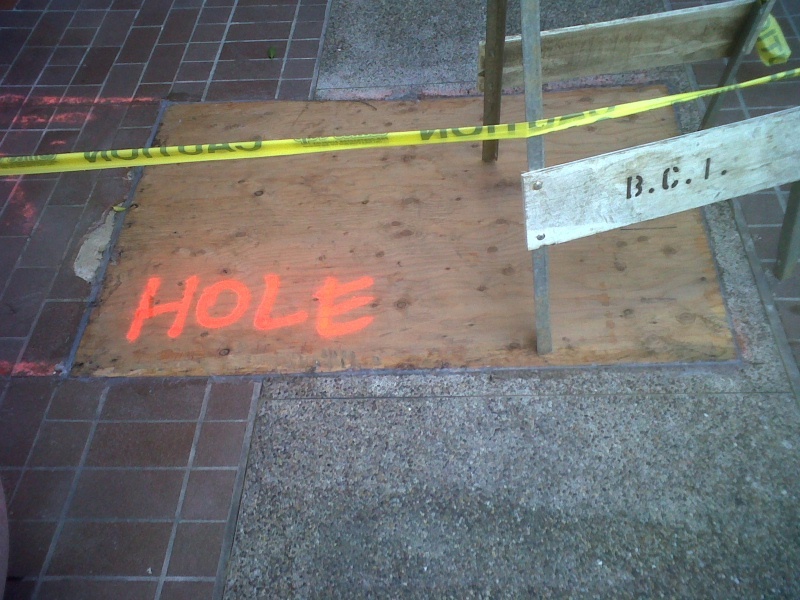 For six months, they will be working in our building. They have walled off all of the lobby except the elevator lobby. We can use only one entrance. They fenced off our half of the plaza. Next week they will demolish the plaza and the lobby. Should be noisy. 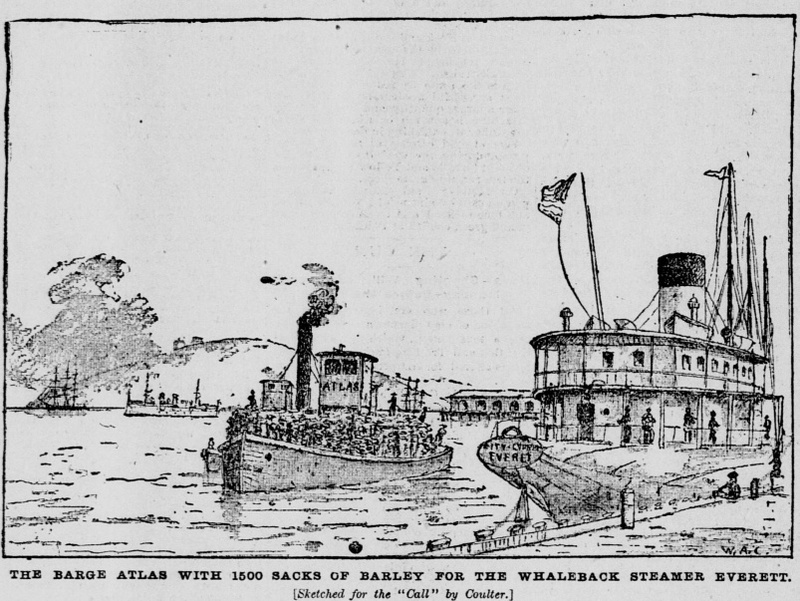 "Yesterday the steamer Merren towed the big barge Attus (Atlas? - JT) down from Stockton with 15,000 sacks of barley, which is to be loaded in the whaleback City of Everett for New York by way of Panama." Several shipbuilders promoted whalebacks as the next big thing in the 1880s and 1890s. The hull curved like the back of a whale. From the 29-June-1895 San Francisco Call. William A Coulter did many maritime drawings for the newspaper. Click on the image to see a larger version. I was getting ready for bed last night and I turned on KCSM. Sunday nights I always look forward to Mal Sharpe's program Back on Basin Street. Last night he said that he was doing his last show. I'm sad. I've been listening to the show since he replaced Jazzbeaux. 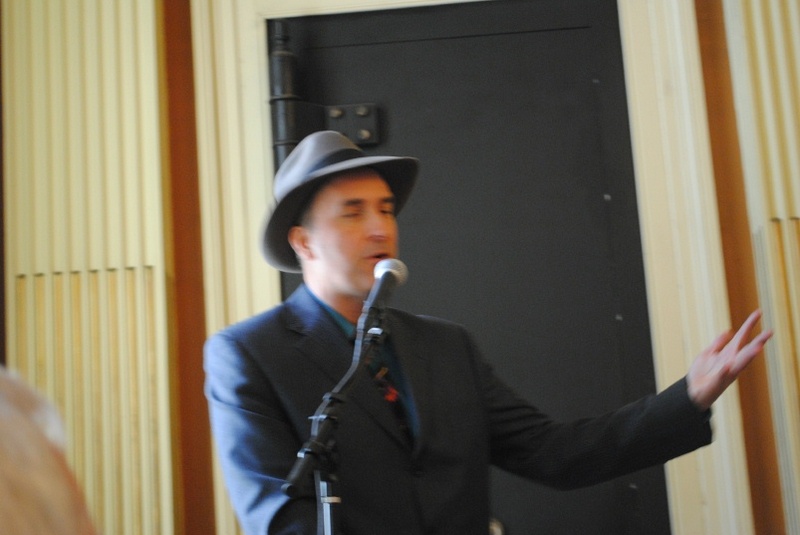 He played a Coyle and Sharpe routine, the DIY operation, saying that was the last time anyone on KCSM would play Coyle and Sharpe "expect maybe Alisa Clancy." 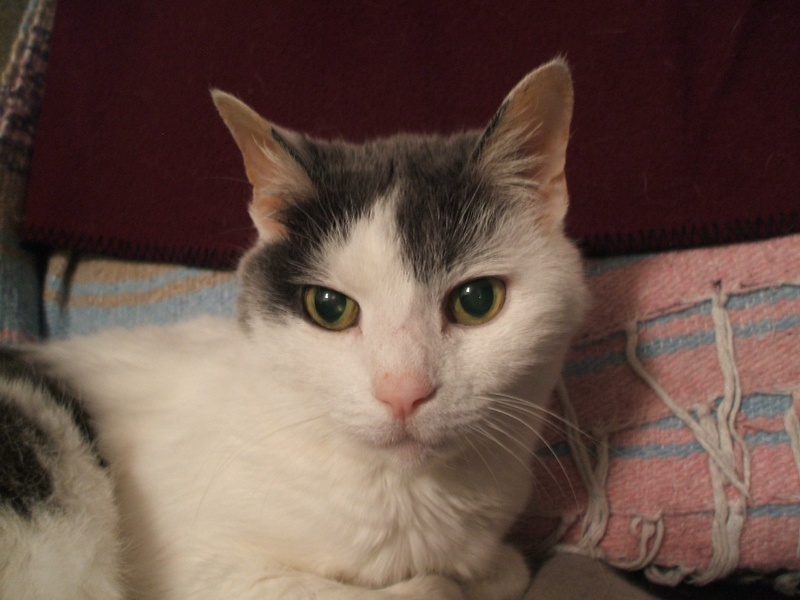 I went to sleep before the show was over, so I missed Jimmy Durante singing "Goodnight, Mrs Calabash." My daughter took this elegant portrait. All rights reserved. Today our daughter went to an event at Star of the Sea Church. My wife and I wanted to walk around our old neighborhood. It was raining lightly when we parked in the lot on Ninth Avenue. We went to the Walgreens in the former Coliseum Theater and bought a nice golf umbrella. We walked past Pinelli's Flowerland, where I bought her flowers every ten days after we got married. I had to slow down after we bought a house. We walked past the doughnut place where I used to buy us treats. We went to Schubert's Bakery and bought pastries. I had forgotten how small it is. We wound up by Busvan's, which closed recently. We bought the computer desk I am sitting at as I type this at Busvan's. On the way back, we stopped at See's Candy and bought some items for Easter. The clerk was talkative. A man came in with two small children who were very excited. We went to the Richmond Branch Library, where I had spent a lot of time when I was growing up. We walked through the door and the desk was gone. I was disappointed to see that there are not many books, upstairs or downstairs in the children's room. The library is cleaner and brighter than it was before. I found only a few books I had read still on the shelves. It was raining harder when we left the library. We went back to the car and went for a little drive. After the event was done, we went to Bill's Place to have lunch, but it was jammed. We drove back to Pacifica and ate at Rockin' Robs. We went home and listened to the Giants on the radio. Spring training is nearly over. We went to five o'clock mass and it was still raining hard. 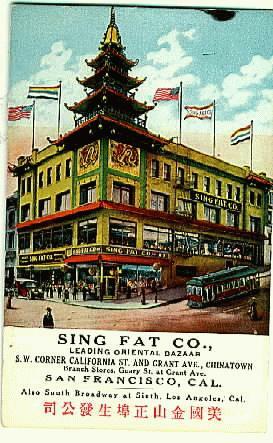 This sign on California near Grant reminds us about the late, great Sing Fat Company Oriental Bazaar, seen below in an old postcard. 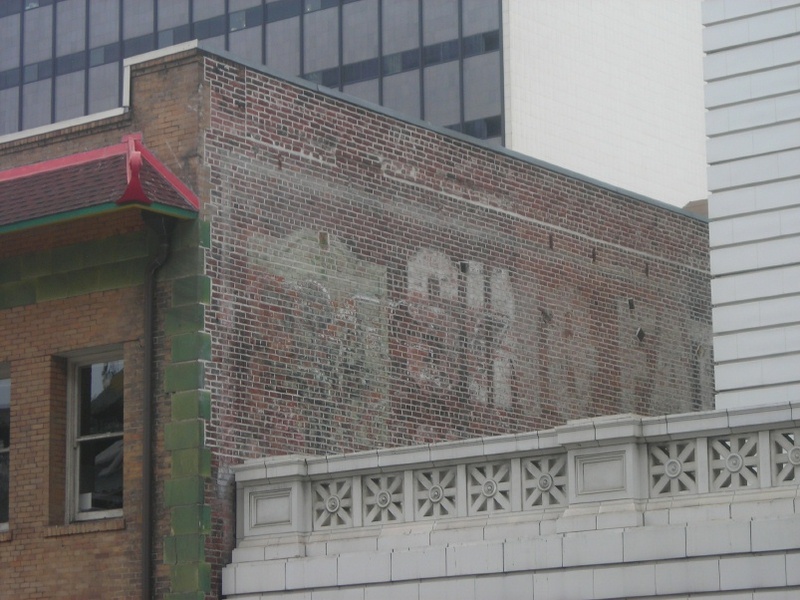 The sign is on the uphill side of the building on California Street. 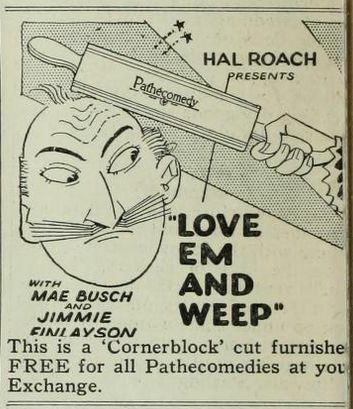 An ad from the 1927 Film Daily Yearbook. I wonder who took the photo. 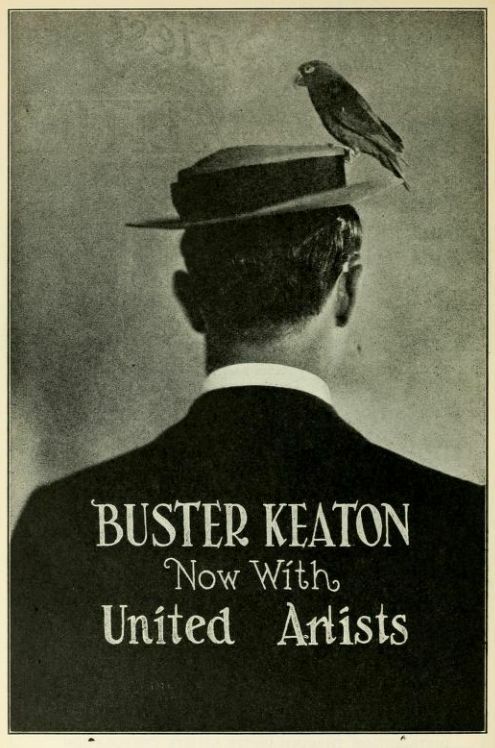 Posing with a bird on his hat while wearing a dark-colored coat just proves his courage. 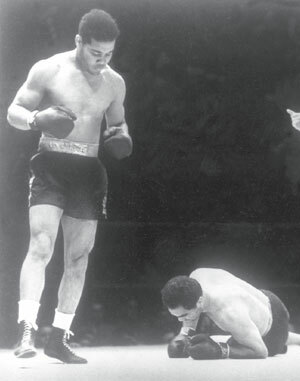 Joe Louis, the Brown Bomber, was perhaps the greatest heavyweight champion. I think he had a better range of opponents than Muhammad Ali. Here he is just about done demolishing former champ Max Schmeling in two minutes and four seconds in their second fight on 22-June-1938. Schmeling had won their first fight, Louis' only defeat up to that point. Schmeling was never a Nazi, but once he had become heavyweight champion in 1930, the Nazis adopted him as a symbol of Aryan supremacy. Joe Louis had other ideas about supremacy. In later years, they became friends. 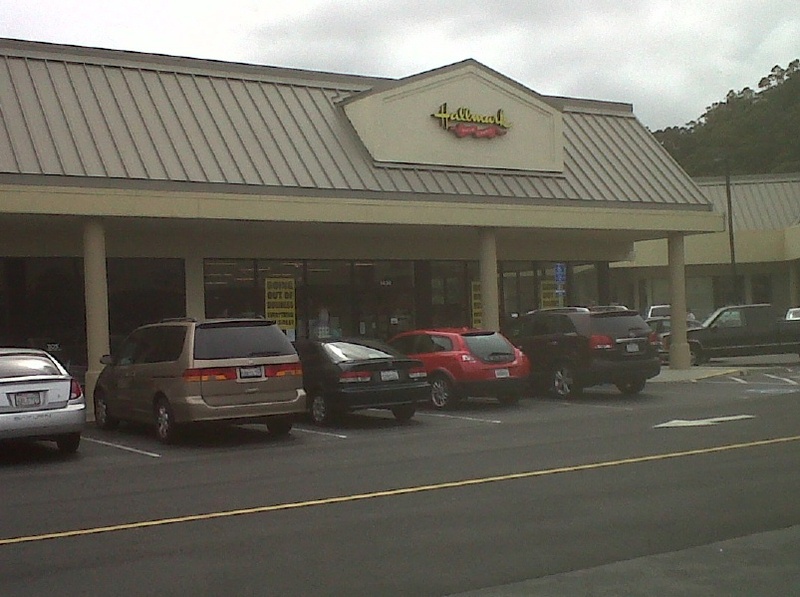 I was sad to learn a while ago that the Hallmark store in the Linda Mar Shopping Center is closing soon. I took the photo yesterday. 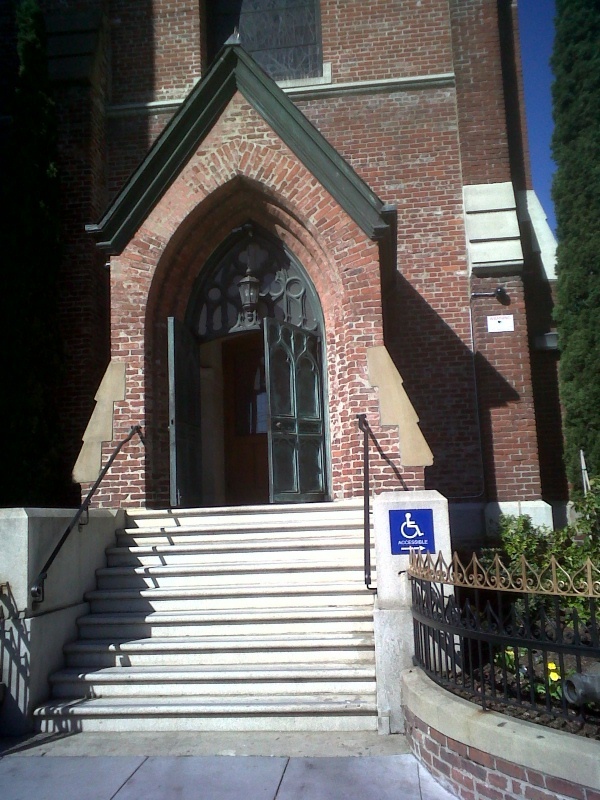 I took this photo at Saint Patrick's Church on Mission Street on 14-February-2012. I like old bricks. It rained again today. I worked from home. New York Giant and vaudeville performer Turkey Mike Donlin got his nickname from his swagger on and off the field. 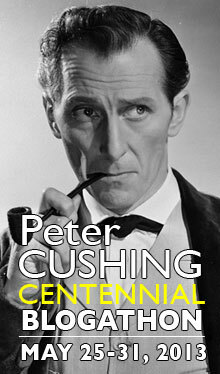 He married actress Mabel Hite and left baseball for the stage. And came back. And left. And so on. This article, from the 31-July-1909 Tacoma Times, talks about how Miss Hite reformed him. It didn't last. Bob Fitz was heavyweight champ Bob Fitzsimmons. John McGraw managed the New York Giants from 1903 to 1933. E H Sothern was a famous Shakespearean actor. Eddie Foy was a musical comedy and vaudeville star. 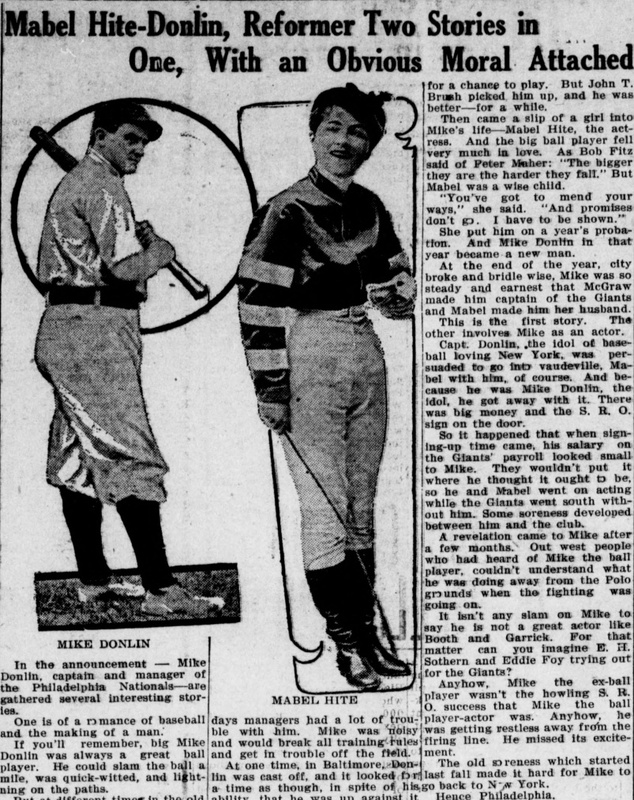 In the announcement — Mike Donlin, captain and manager of the Philadelphia Nationals — are gathered several interesting stories. One is of a romance of baseball and the making of a man. If you'll remember, big Mike Donlin was always a great ball player. He could slam the ball a mile, was quick-witted, and lightning on the paths. But at different times in the old days managers bad a lot of trouble with him. Mike was noisy and would break all training rules and get in trouble off the field. At one time, in Baltimore, Donlln was cast off, and it looked for a time as though, in spite of his ability, that he was up against it for a chance to play. But John T Brush picked him up, and he was better — for a while. 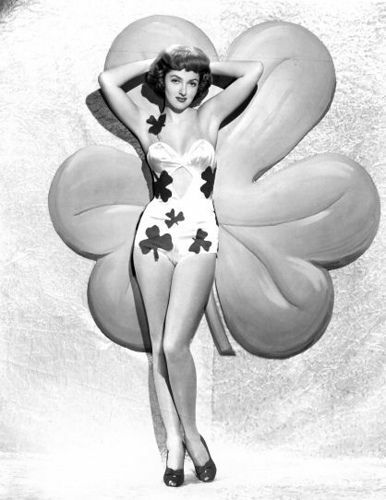 Then came a slip of a girl into Mike's life - Mabel Hite, the actress. And the big ball player fell very much in love. As Bob Fitz said of Peter Maher: "The bigger they are the harder they fall." But Mabel was a wise child. "You've got to mend your ways," she said. "And promises don't go. I have to be shown." She put him on a year's probation. And Mike Donlin in that year became a new man. At the end of the year, city broke and bridle wise, Mike was so steady and earnest that McGraw made him captain of the Giants and Mabel made him her husband. This is the first story. The other involves Mike as an actor. Capt. Donlin, the idol of base-ball loving New York, was persuaded to go into vaudeville, Mabel with him, of course. And because be was Mike Donlin, the Idol, be got away with it. There was big money and the S. R. O. sign on the door. So it happened that when signing-up time came, his salary on the Giants' payroll looked small to Mike. They wouldn't put it where he thought it ought to be, so he and Mabel went on acting while the Giants went south without him. Some soreness developed between him and the club. A revelation came to Mike after a few months. Out west people who had heard of Mike the ball player, couldn't understand what he was doing away from the Polo grounds when the fighting was going on. It isn't any slam on Mike to say he is not a great actor like Booth and Garrick. For that matter can you imagine E. H. Sothern and Eddie Foy trying out for the Giants? Anyhow, Mike the ex-ball player wasn't the howling S. R. O. success that Mike the ball player-actor was. Anyhow, he was getting restless away from the firing line. He missed its excitement. The old soreness which started last fall made it hard for Mike to go back to New York. 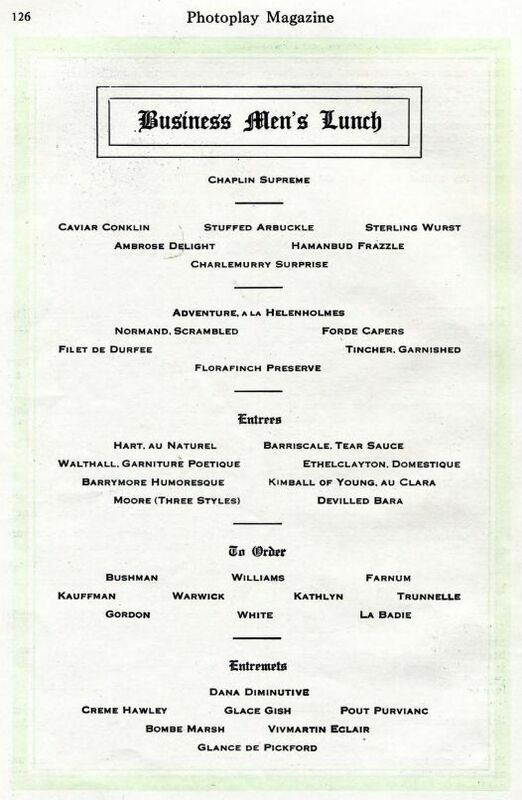 I came across a page titled "Business Men's Lunch" in the November, 1915 Photoplay. I started looking at the items and noticed all sorts of interesting things like "Chaplin Supreme," "Stuffed Arbuckle," and "Kimball of Young, au Clara." The only one I don't understand is "Moore (Three Styles)." 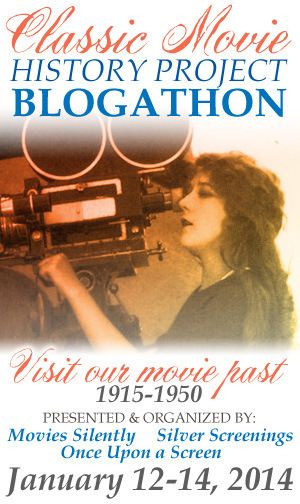 Is that Owen Moore, Mary Pickford's first husband? 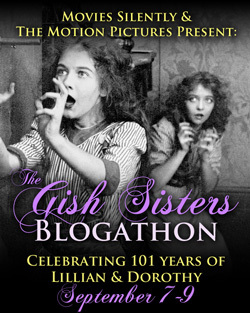 "Glace Gish" is very funny. 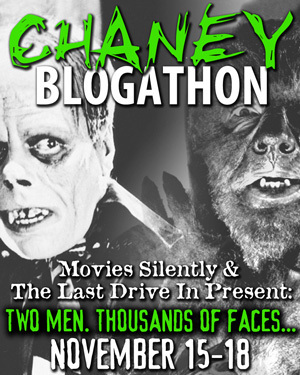 Be sure to click on the image to see a larger version. I took this photo of Annie Street today, looking towards Market from Jessie Street. 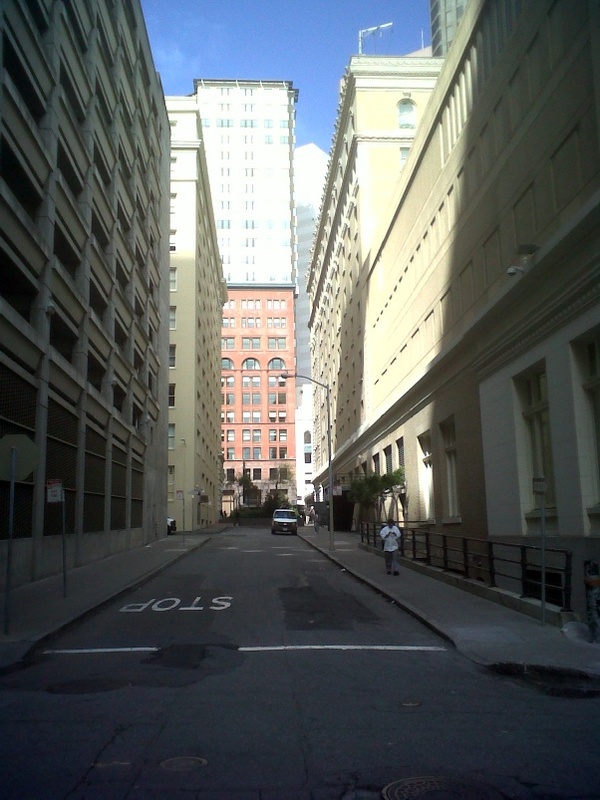 The Hearst Garage is on the left. Beyond that, across Stevenson, is the back corner of the Monadnock Building. On the corner is the door that leads to the underground space that once contained the Dawn Club, home of Lu Watters' Yerba Buena Jazz Band. Across Market is the De Young Building. On the right in the Palace Hotel. Today was the first full day of Daylight Savings. It was very dark and cold this morning. Today I did a walking tour for people who bid on me for an auction at a school on the Peninsula. They were a nice group who asked good questions. As usual, we met in front of Peet's Coffee in the Ferry Building and went on from there. They liked the murals in Rincon Annex and Jackson Square. The rain held off. We had lunch at the Irish Bank. I was surprised to see that the Hippodrome has become an art supply store. I remarked that they had stuff piled in front of the reliefs of naked women. A member of the tour suggested that this was because children might be visiting to buy art supplies. I took the photo of Bliss and Faville's Southern Pacific headquarters many years ago. 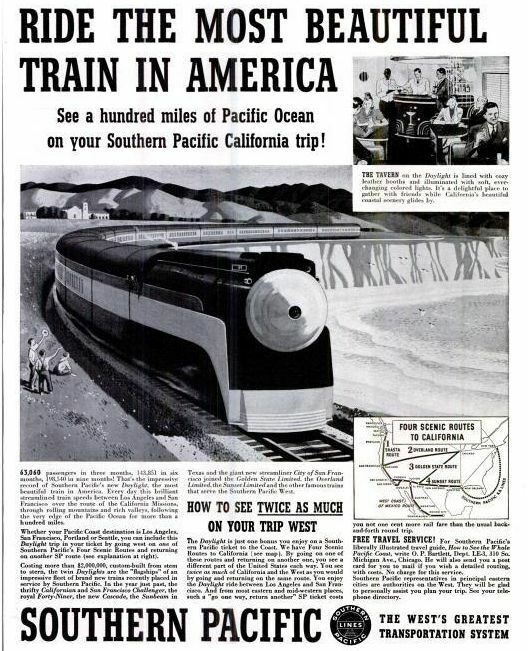 This ad from the 29-March-1938 Life Magazine invites the public to ride the most beautiful train in America, the Coast Daylight, which ran between San Francisco and Los Angeles. Beauty referred to both the dedicated equipment and the coastal scenery. 150 years ago the USS Monitor met the CSS Virginia at Hampton Roads in the first battle of ironclad ships. Virginia was built on the hull of the steam frigate USS Merrimack, which had been burnt when the Confederates took the Norfolk Navy Yard in 1861. In response, the Union initiated a crash program to build three ironclad warships. The Monitor, designed by Swedish-American engineer John Ericsson, was the most radical design. Virginia had torn through a squadron of Union wooden ships the day before. Monitor was a more formidable opponent. However, each ship, firing solid shot, was unable to inflict major damage on its opponent and the result of the four-hour battle was a draw. In May, the Union recaptured Norfolk. Virginia could not escape past the blockade into the Atlantic and could not retreat up the James River because of her excessive draft. Her crew was forced to blow her up. The Monitor, which was not built for the open ocean, sank in December in a storm off of Cape Hatteras while being towed south for blockade duty. U.S. Naval History and Heritage Command Photograph #: NH 50954. Doctor Peter Henri Van Der Weyde wrote the series of articles which gave this blog its name. This item, from the September, 1871 Manufacturer and Builder, introduces him as editor-in-chief after co-founder and co-editor Charles Callis Western passed away. We are happy to congratulate our readers that we have made permanent arrangements with Prof. P. H. Van der Weyde as the editor-in-chief of THE MANUFACTURER AND BUILDER. Prof. Van der Weyde has been a co-laborer with Mr. Charles Callis Western, lately deceased, since the establishment of this journal, and has been the author of most of the original papers appearing in its pages. His well-known reputation is a guarantee that THE MANUFACTURER AND BUILDER will remain the best publication of its kind in this country, and inferior to none, even in Europe. 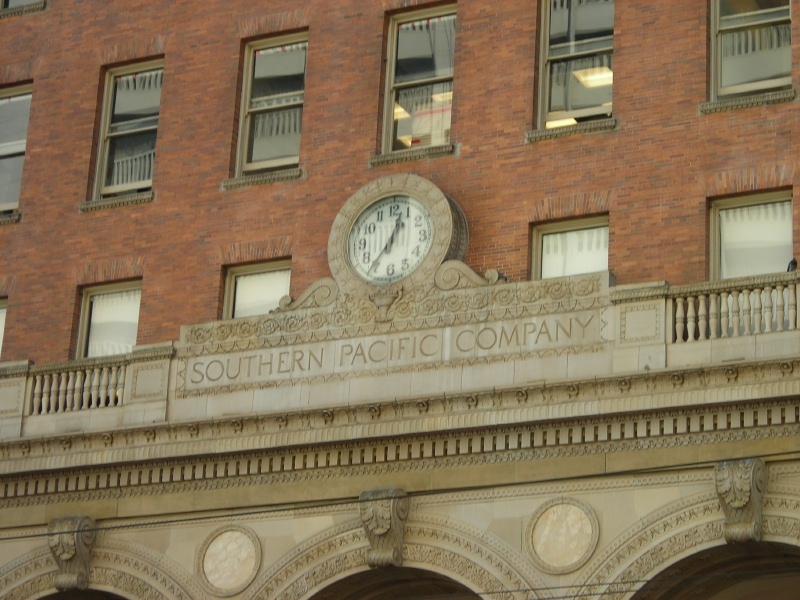 Reno's Southern Pacific Freight House. The trench with the tracks is visible to the left of the Freight House. 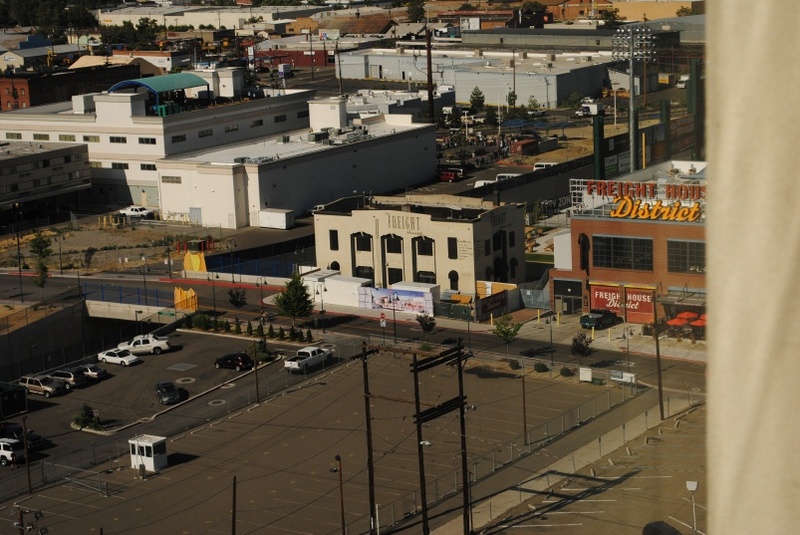 The Freight House district is a redevelopment project that includes the ballpark of Reno's AAA Pacific Coast League team, the Aces. 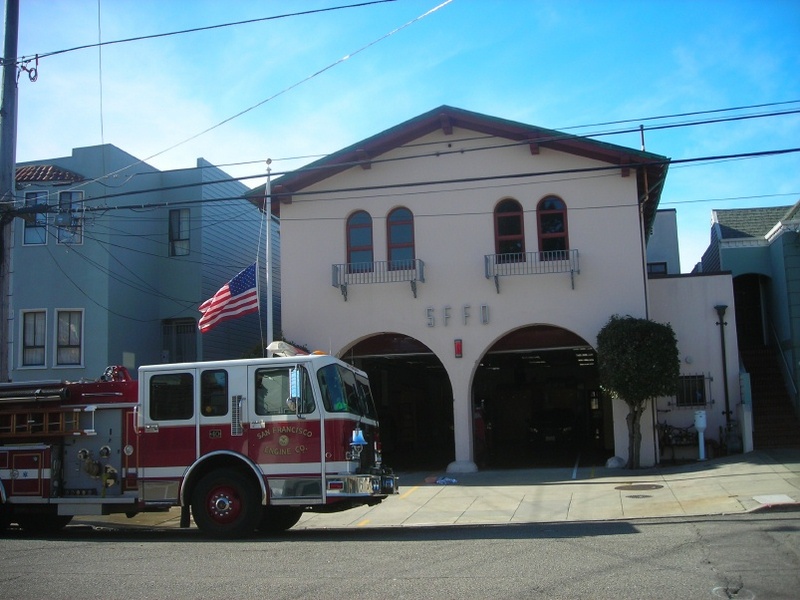 Engine 40 on 18th Avenue in the Sunset has a nice Mission Revival style. 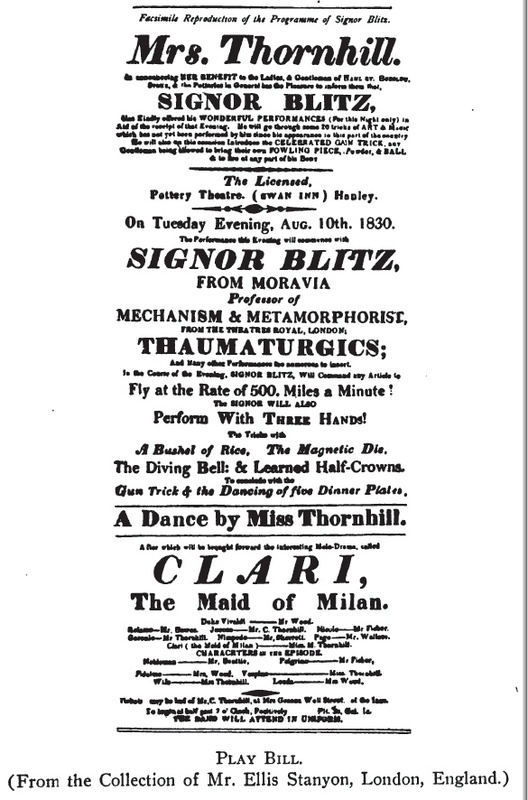 British magician Antonio Van Zandt performed as Signor Blitz. His act combined magic and comedy. He performed in America during the Civil War. This program was reproduced in The Old and the New Magic by Henry Ridgely Evans, 1906. The weather was warm and clear today. I have a cold. Today I attended the second annual San Francisco History Expo at the Old Mint. There was a line of people on the steps waiting to get in before it opened. There were more exhibitors this year, including the Friends of the Cable Car Museum. I had nice chats with José Godoy and Don Holmgren and got to meet Mike Phipps, who has written a new book about cable cars, which should be out soon. I heard Woody LaBounty talk about Carville, and had a nice chat with him later. Here is a photo of Woody giving his talk. Then Don Holmgren spoke about San Francisco's cable car lines in 1890. After that, I met my daughter, who had been out shopping, and we had sandwiches at Latte Express. The weather was clear and relatively warm today. Walter Brookins was a native of Dayton, Ohio. 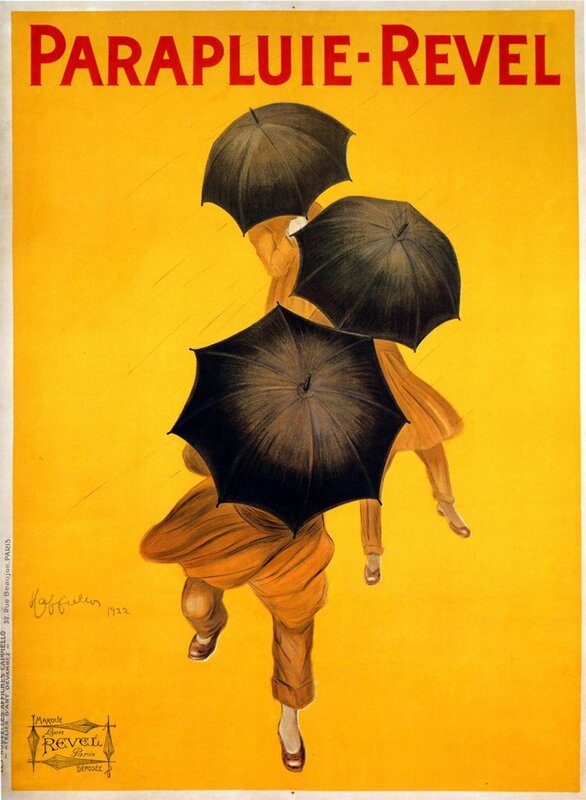 The Wright Brothers taught him to fly and he became the first leader of their exhibition team. In January, 1911, he took part in a meet at Tanforan where several important aviation firsts took place, including dropping a bomb and landing on a ship. 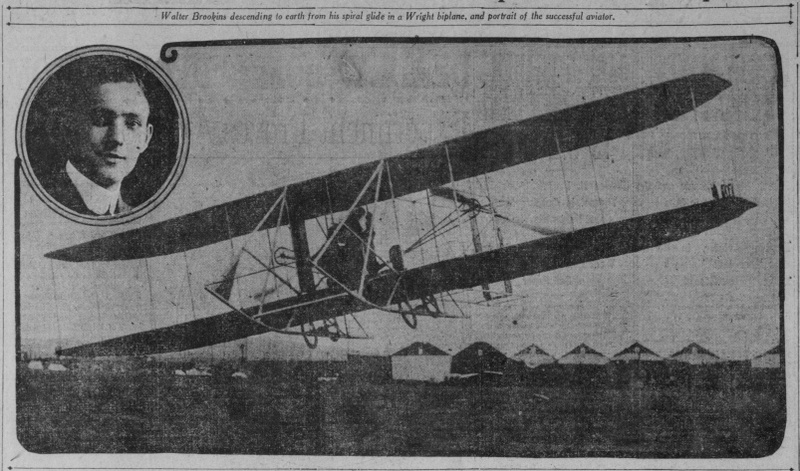 The image shows him landing his Wright airplane after a stunt flying exhibition. From the 16-January-1911 San Francisco Call.Click on the image to see a larger version.